A diagram of the IS/LM model. A economic model is a theoretical construct representing economic processes by a set of variables and a set of logical and/or quantitative relationships between them. 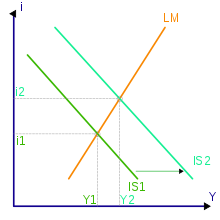 The economic model is a simplified framework designed to illustrate complex processes, often but not always using mathematical techniques. Lars Peter Hansen In: David Brancaccio (2013) "Nobel Prize in Economics winner Lars Peter Hansen on imperfect models" at marketplace.org. Economists also use models to learn about the world, but instead of being made of plastic, they are most often composed of diagrams and equations. Like a biology teacher’s plastic model, economic models omit many details to allow us to see what is truly important. Just as the biology teacher’s model does not include all the body’s muscles and capillaries, an economist’s model does not include every feature of the economy. Haavelmo was the ﬁrst to recognize the capacity of economic models to guide policies. This paper describes some of the barriers that Haavelmo’s ideas have had (and still have) to overcome, and lays out a logical framework that has evolved from Haavelmo’s insight and matured into a coherent and comprehensive account of the relationships between theory, data and policy questions. The mathematical tools that emerge from this framework now enable investigators to answer complex policy and counterfactual questions using simple routines, some by mere inspection of the model’s structure. The corporatist-economic model of society appears to be governing us. Economists, often in the pay of transnationals, are deciding, for us, what democracy is, and will be. The striking parallel between the economic models that are currently under discussion and some engineering systems suggests the hope that in some way the rapid progress in the development of the theory and practice of automatic control in the world of engineering may contribute to the solution of the economic problems. This page was last edited on 11 July 2017, at 02:32.